Mitigating global warming and embracing sustainable development goals based on decarbonization is the sole remaining ticket to an environmentally responsible and economically vibrant future, stressed the head of an intergovernmental scientific body with credible authority on climate change in a media interview last week. The press conference discussed the significance of the 48th Session of the IPCC to be held in Songdo, Incheon, from Oct. 1-5, where a Special Report -- assessing impacts of global warming of 1.5 degrees Celsius above preindustrial levels, with recommended mitigation pathways -- will be released as part of the sixth Assessment Report cycle. The report’s findings will be crucial for implementing the Paris Agreement and form the basis of scientific inputs at the COP24 in Katowice, Poland, from Dec. 3-14. At the latest UNFCCC conference of parties, the COP23, and again at the One Climate Summit in Paris last year, French President Emmanuel Macron declared the country’s continued and enhanced support for the IPCC and science. France hosted the IPCC’s 47th session in Paris last March, where the organization’s 30th anniversary was celebrated. “If the world continued on a path of economic development using the old paradigm, the consequences of global warming will be beyond our imagination,” he stressed, adding the IPCC acts as a conduit for the world’s policymakers by providing realistic alternatives and solutions based on science. The IPCC -- an intergovernmental body under the United Nations -- is tasked with providing scientific analyses of climate change and its impact on the global economy, as well as options for adaptation and mitigation. Established in 1988 by the World Meteorological Organization and the United Nations Environment Program, and later endorsed by the United Nations General Assembly, the organization has an internationally accepted authority on climate change. It won the 2007 Nobel Peace Prize together with former US Vice President Al Gore. The institution produces reports supporting the United Nations Framework Convention on Climate Change -- the main international treaty on climate change, whose objective is to stabilize greenhouse gas concentrations in the atmosphere to a level preventing dangerous anthropogenic interference in the climate system. The panel does not conduct its own original research, nor monitor the changing climate, but produces assessments using published literature authored by some 2,500 of the world’s leading scientists and experts from across 130 countries. Lee added that to reach the aspirational 1.5-degree target, “negative emissions” strategies will be needed. A crucial aspect of reducing emissions has become spreading zero-carbon electricity production systems as soon as possible, he noted. The 2015 United Nations Climate Change Conference -- known as the COP 21 (the 21st yearly session of the Conference of the Parties since the 1992 United Nations Framework Convention on Climate Change) -- was held in Paris in late 2015, with 196 countries’ representatives participating to negotiate their futures. Since 1988, the IPCC has produced five Assessment Reports intended for policy relevance rather than prescription. The fourth Assessment Report formed the basis for the 2009 Copenhagen Accord, where some 100 countries first recognized the need to curb global warming to 1.5 degrees Celsius. The fifth cycle released from 2013-14 led to the UNFCCC conclusion that the 2-degree limit was not enough, and helped forge the Paris Agreement, with the goal of limiting global warming to “well below 2 degrees Celsius” and pursuing 1.5 degrees. Responding to a question by The Korea Herald as to whether the current climate negotiations adequately considered divergent positions and interests of developed and developing countries, Lee said differences had “always existed” between the two groups. He added that the Paris Agreement was able to provide mechanisms for cooperation between the two sides. “We need to improve our understanding of decision-making by countries, cities, businesses, consumers and citizens, because implementing the Paris Agreement is not just about technology,” Lee said in front of foreign diplomats at the embassy. Lee received his bachelor of arts in economics from Seoul National University and doctorate in economics from Rutgers University. 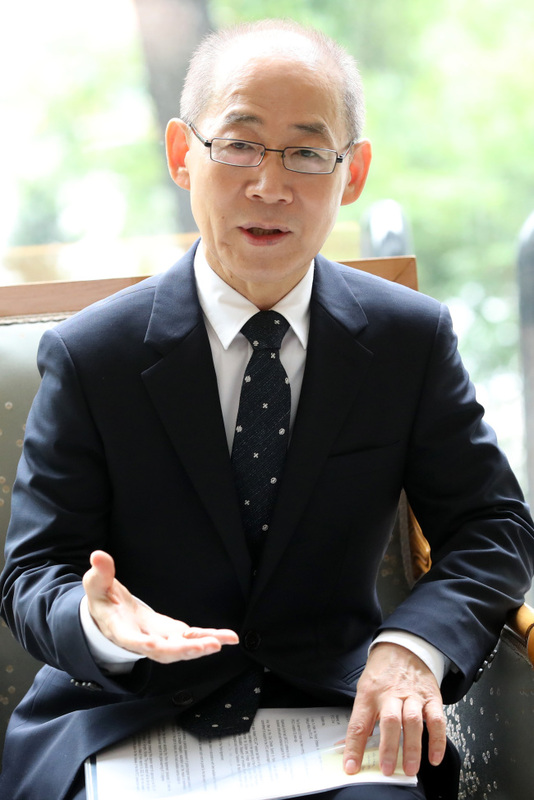 Aside from being the chair of the IPCC on Oct. 6, 2015, he is currently a distinguished professor at Korea University’s Graduate School of Energy and Environment. Lee is the younger brother of Lee Hoi-chang, the former South Korean Prime Minister and three-time presidential candidate.